Path MEGAzine > News > Christian Contemporary > The Dove Awards Continue to Support Gospel Diversity, But Will Radio and Fans Follow? 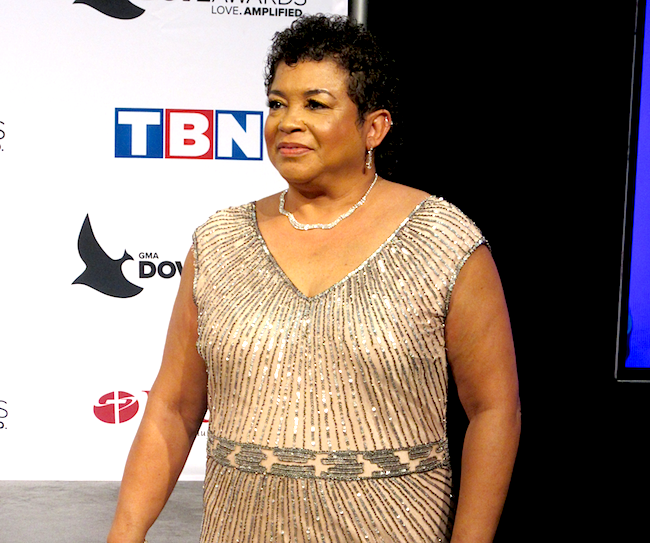 The Dove Awards Continue to Support Gospel Diversity, But Will Radio and Fans Follow? 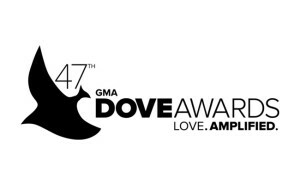 The theme of the 47th Annual GMA Dove Awards was “Love Amplified” and this was evident throughout the night, exemplifying gospel music diversity in its presenters, performers, and award recipients and showcasing the Gospel Music Association’s continuing efforts to break down barriers in musical tastes and racial divides. Multiple award-winning contemporary gospel artist, Tye Tribbett, had the honor of co-hosting this year’s GMA Doves with Christian pop duo, for KING & COUNTRY, who won this year’s Dove for Contemporary Christian Artist of the Year. In their opening speech, the co-hosts echoed Patillio’s same sentiment of diversity, as well as unity, within the gospel music community. “Joel and Luke (Smallbone) are brothers, like, from the same mother…but here’s the difference, they’re MY brothers, too. Can you see the resemblance? We’re ALL brothers tonight,” Tribbett said of his co-hosts. Joel and Luke agreed. “It’s fair to say we all bring a different flair, a different flavor, and we are here to celebrate that great diversity. In such a time as this – when you’ve got political division, when you’ve got racial tension, you’ve got religious extremism, it feels as though nights like tonight…this time is more important than ever to rally together and point people heavenward. So tonight, we’re all family here and we’re celebrating what God is doing IN and AROUND us,” they said. On that note, veteran CCM superstar and multiple Dove Award winner, Steven Curtis Chapman, delivered his worshipful tune, “Jesus, the One True God,” backed by a 150-member GMA Fan Choir. The audience was treated to an electrifying performance of “Work It Out” by Tribbett and his amazing ensemble later in the show. Earlier, urban gospel’s sweetheart, Tamela Mann, set the tone for the night with an energetic opening performance of “One Way”, an up-tempo track with an old-school flavor. Mann, who was nominated for Contemporary Gospel/Urban Recorded Song of the Year for “One Way”, talked about the different sound on her latest album of the same name, in comparison to her previous efforts. “I know a lot of people are used to me doing ballads but I kind of took myself out of the box on this record,” said Mann. “I just really feel like it’s something everybody needs for everything they may be going through,” she said. Mann is set to launch her “ONE WAY” Tour in February 2017, a family tour that will feature comedy and singing from her talented husband and business partner, David Mann, and their children. Veteran CCM trio, Phillips, Craig & Dean, was celebrated for their 25 years in ministry and music with a video retrospective of their body of work. The golden-voiced trio then treated the audience to a medley of some of their #1 hits, which is a total of 23, so far. “We started out in ‘91 with a little cassette tape. Y’all remember what those are?”, said Randy Phillips, drawing laughter from the crowd. “We put out our first demo in ‘94 and sent it all over the nation, much to our chagrin. But it actually turned out to be a bright turn for us, and we just feel really honored and humbled to get to still do this, to still to be heard on the radio,” he said. The three-time Dove Award winners serve as lead pastors of their respective churches (Austin, Dallas, and St. Louis) but they didn’t start out that way. “The same churches we started with when we began Phillips, Craig & Dean, we started in different capacities but we now lead those churches,” said Shawn Craig. “There was a lot of pressure back when we started, to move to Nashville. To get serious about music would mean to move away from our churches. Our record company and consultants felt like we needed to minister to the ‘larger’ church, moving away from the local church. But we didn’t do that. We stayed true to our vision and the Lord has been good to us. And the fact that we’re still here 25 years later is a true testament to the grace of God and the very strong friendship among us,” Craig said. Dan Dean added, “We just did a tour of the Northeast and we’re amazed that auditoriums were filled with people who remember us, sing our music, and play our music. The Lord has been so good to us.” The trio just completed their 14th album, a hymn project filled with songs they did growing up, which is due out in spring 2017, along with a tour launch. Multiple Grammy and Dove Award winner TobyMac (short for McKeehan) snagged this year’s Dove Award for Pop/Contemporary Album of the Year for his latest release, “THIS IS NOT A TEST”. With heartwarming shout-outs to his wife and creative team, he shared, “To me, it’s still about songs. You get in the trenches in the studio and you just hope that you can write a song that turns people’s eyes to God,” said TobyMac. The fan favorite, also known as “T-Mac”, went on to thrill the crowd with a double-dose of amazing, high-energy performances – “Til the Day I Die” with his current band, Diverse City, and “Love Feels Like”, a nostalgic reunion with his original bandmates, DC Talk. Hollyn’s full album, due next year, will feature a blend of pop, R&B, and other genres. “We want to incorporate the modern sounds of major music and put in our unique way of sharing the gospel. I’m trying to reach people that are my age, alongside the audience I already have,” she said. The vocal and musical sensation was honored to be the youngest nominee in this year’s New Artist of the Year category. “I think our industry needs a lot more young people in it, to touch base with the culture, what’s happening in youth culture, in our generation, and what we wanna stand for as believers,” said Hollyn. “I think you can do that in a COOL way, I think you can do it in a MODERN way that doesn’t turn people off to the gospel. I think you can do it in a way that’s gonna be CREATIVE and inspire the youth of today to say, ‘Hey, that’s a CHRISTIAN song? But it’s DOPE!’ That’s what I want people to do when they hear my music. I don’t wanna compromise for anything,” she said. 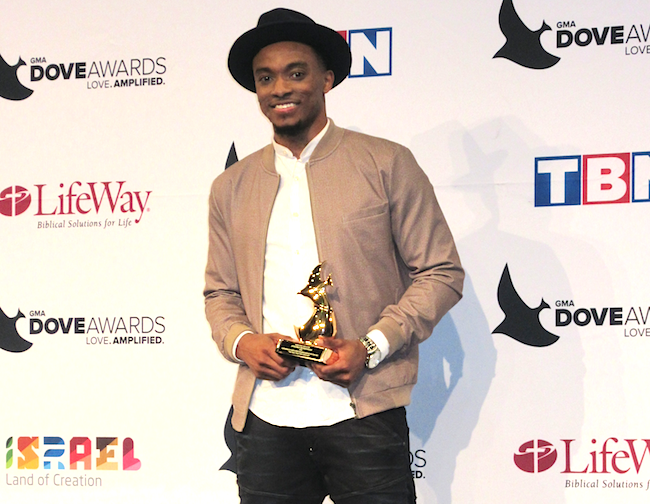 Jonathan McReynolds, multiple Stellar Award nominee and winner of this year’s Dove Award for Contemporary Gospel/ Urban Album of the Year for “LIFE MUSIC: STAGE TWO”, wowed the crowd with his silky-smooth vocals and piano play on his hit single, “The Way That You Love Me”. McReynolds said he is lining up an incredible tour promoted by Live Nation. He wouldn’t spill too many details but he did say the tour will feature himself and “a few really good gospel artists I think you’ll be happy with.” Undoubtedly, many of his fans are hoping to catch some of the creative mastery he displayed on his surprise EP, “SESSIONS”, which features several revamped tunes from his “STAGE TWO” release. “When you’re a musician, you just have fun all the time, always changing stuff, remixing stuff, giving a different approach to songs we’ve already done. I think we get bored really quickly. Doing it like the album for two weeks is too long, so sometimes, we just go in the studio and mess around and that’s what you heard on ‘SESSIONS’. It was literally just some sessions of our making music. And we put it together, and I’m really glad that people are enjoying it,” said McReynolds. Fans can expect a new album release from the talented musician and singer in April 2017. Hot new CCM balladeer, Danny Gokey, won this year’s Dove Award for Christmas Album of the Year for his 2015 release, “CHRISTMAS IS HERE”. 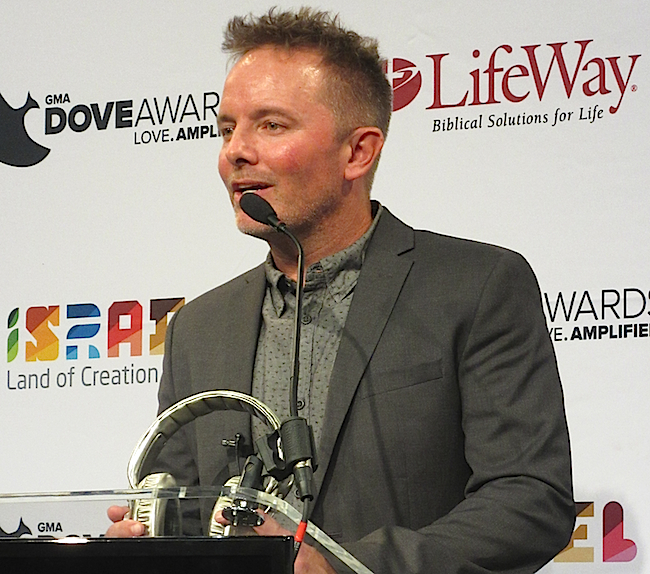 He also snagged a Dove nom for Contemporary Christian Artist of the Year, as well as noms for Pop/Contemporary Recorded Song of the Year and Short Form Video of the Year for his powerful and uplifting radio hit, “Tell Your Heart To Beat Again”. Gokey, who delivered passionate lead vocals on William McDowell’s worship ballad, “Sovereign God” (from McDowell’s widely celebrated 2013 release, “WITHHOLDING NOTHING”), says the concept for “Tell Your Heart to Beat Again” was based on a true story. “My first wife died of a heart condition. I said, ‘God, what if You could take this song and restore people’s lives?’ That was a huge thing. So, honestly, I wanted to see good come out of that situation, even though I was a few years removed from it,” said Gokey, whose first wife died back in 2008 but the song didn’t appear until 2014 on his project, “HOPE IN FRONT OF ME”, and the track is still dominating the airwaves. “It’s been my biggest song yet – It’s made such an impact on people’s lives,” said Gokey. “I love how even though it’s several years removed, God still wants to take those hurting and broken situations, and He still wants to bring good out of it. We forget sometimes, and we bury it, but God doesn’t bury it, and God doesn’t forget it.” Gokey is currently touring the country with his “Be One” tour. Hillsong United, just one part of the bombshell worship franchise out of Hillsong Church in Australia, performed their hit single, “Prince of Peace”. The globally recognized worship band claimed two Dove Awards this year — Worship Album of the Year and Recorded Music Packaging of the Year — out of a whopping SEVEN nominations for their latest release, “EMPIRES”. The band also just released a movie, entitled “HILLSONG: LET HOPE RISE”. Up-and-coming worship leader, Todd Dulaney, delivered his riveting version of “The Anthem” on acoustic guitar, which was nominated for Urban Worship Recorded Song of the Year. Originally made famous by the ground-breaking worship band, Planetshakers, in 2008, Dulaney put his heart-stirring spin on it for his latest project, “A WORSHIPPER’S HEART”. 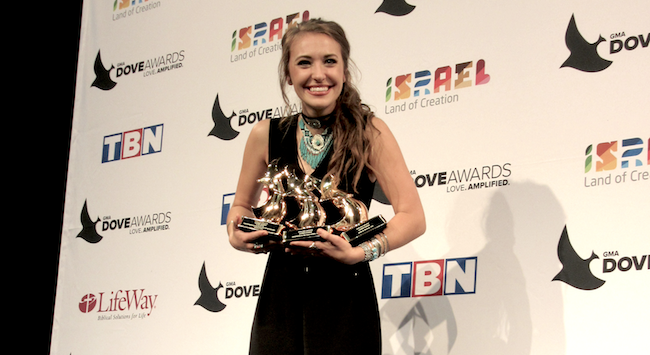 CCM darling Lauren Daigle’s latest release, “HOW CAN IT BE” was recently RIAA-certified gold, winning her three Dove Awards in 2015 – New Artist of the Year, along with Song of the Year and Pop/Contemporary Song of the Year for the title track, “How Can It Be”. 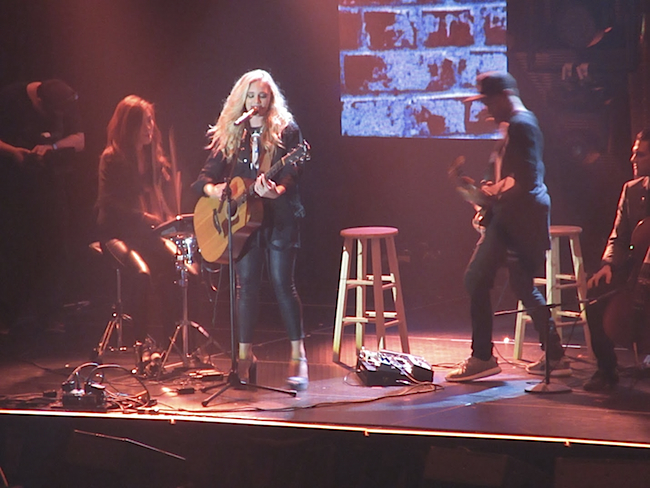 With the project still dominating charts and airwaves, Daigle struck gold again at this year’s Dove Awards, snapping up the hardware for Artist of the Year, Songwriter of the Year, and Pop/Contemporary Song of the Year for her single, “Trust in You”. 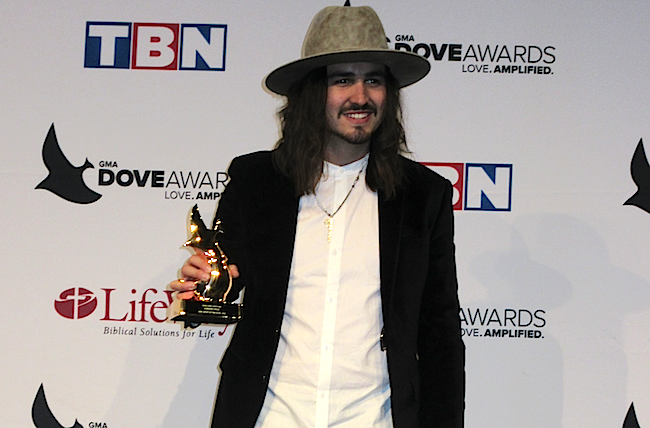 In addition to all the Dove Award accolades, the 24-year-old’s budding career already includes a Billboard Music Award for Top Christian Album, a Grammy nomination for Best Contemporary Christian Music Album, an American Music Award nomination for Favorite Artist/Contemporary Inspirational, and a recently sold-out 12-city headlining tour. PLUS, her Christmas album, “BEHOLD”, which will feature New Orleans jazz Christmas classics, is due out on October 21st. Daigle was asked about her reaction each time she receives an award. “One of my friends asked me, ‘Does it hit you, like, right away?’ I said, ‘I think it’s gonna take about a week!’ Typically, it takes about a week to sink in a little bit! 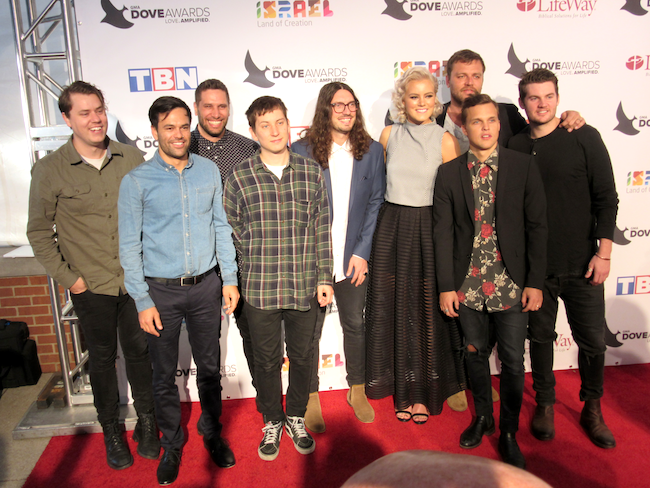 Honestly, just looking back from last year and being completely new to the Dove Awards – it was my very first time — to this year, it was such an embrace of the industry. Just because I was so new, I didn’t know what I was doing, and I still feel really new to all of this, and that embrace is still here, coming back this year. It’s just an honor, honestly, to be up here and to be surrounded by people who genuinely care, and that purity stands. I love that,” Daigle said. Asked how it feels to know that her gold-certified album is resonating so well with audiences, she said, “I’m kind of like in awe. When my album went gold, one of my managers said, ‘You know, Lauren, it’s not 500,000 SALES, it’s 500,000 SOULS. It’s 500,000 people that have heard the Word of God, the Truth of God, and that have encountered His presence.’ And honestly, I had no idea that God would do this. I didn’t know that He would take multiplication in the form of a gold record…I’m just so excited that the Kingdom is being uplifted, that people around the world are hearing His Truth,” she said. But what most overwhelms Daigle about the impact of her music is the stories that flood in from fans. She heard about a teen who was going to commit suicide but right before committing the act, the teen heard Daigle’s song, “Trust in You” on the radio, and decided to seek treatment instead. Another woman posted on social media that she was overwhelmed with fear upon being diagnosed with cancer. She thought the diagnosis meant the end of her life but she, too, heard “Trust in You” on the radio. Said Daigle, “It’s just like the Father to say, ‘Hey, I’m gonna remove cancer from a situation…’ and from various others. That woman later testified that she was healed of cancer and had no more of it in her body. God took that song and made healing just ride on the wings of that song,” said Daigle, who wrote the song after losing her grandfather to cancer. “It was me trying to understand and have clarity of what healing actually meant, so for God to answer my long questions with the stories of all the people that are coming to me, saying, ‘I was healed because I heard your song and God spoke to me in the middle of it,’ it’s just like God to come and bring something full-circle for me,” she said. Adding to an already busy schedule, Daigle will soon be touring with for King & Country, along with Jordan Feliz, this year’s Dove Award winner for New Artist of the Year. Crossover gospel songstress CeCe Winans and smooth jazz/gospel sensation Jonathan Butler served as presenters for Gospel Artist of the Year. 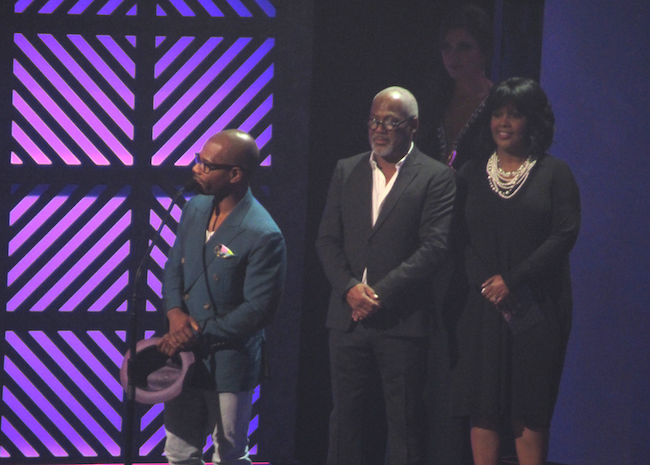 Long-time gospel trailblazer and household name, Kirk Franklin, took home the honors this year for his latest release, “LOSING MY RELIGION”, but his acceptance speech was concerning the world’s stark contrast to the diversity being celebrated by his peers that night. “There’s chaos and calamity in the world…so much hurt and distrust. I have a lot of friends in this room, of many different shades and colors…great men and women in the contemporary Christian community. To all of us, I do not like that the WORLD is controlling the narrative, it should be US controlling the narrative,” Franklin said. “WE have the spirit of redemption when we speak. When we say something, we want to bring it together, not separated. When police and black boys are killed, we need to say something. When we ‘DON’T SAY SOMETHING’, we’re ‘SAYING SOMETHING’… Let’s ask the people to pray with us for racial healing. Let’s don’t stay silent on it,” said Franklin, who then led the audience in a prayer of repentance and healing for the nation. 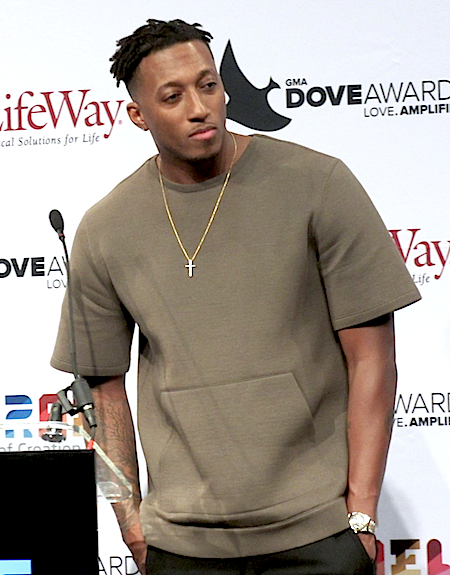 Multiple award-winning rapper, Lecrae, was nominated for Artist of the Year and served as a presenter for this year’s Dove Awards. His album, “CHURCH CLOTHES 3”, was nominated for Rap/Hip-Hop Album of the Year and his song, “Can’t Do You” was nominated for Rap/Hip-Hop Recorded Song of the Year but rapper NF took home the hardware for his latest album, “THERAPY SESSION” and one of Lecrae’s Reach Records label mates, Andy Mineo, snagged the latter statue for his song, “UNCOMFORTABLE”. Lecrae, who has taken home Grammys, Doves, and Stellar Awards, is embarking upon his “DESTINATION TOUR” this fall and promised fans that there will be a lot of collaborations among Reach Records label mates in the near future. Asked how it feels to know that he’s bringing something very unusual to the gospel scene – that is, albums that sell very well in the Christian, rap, and R&B markets – Lecrae responded, specifically, about his “ANOMALY” project, “It feels amazing on one front because that’s the fans, and we’ve had supportive fans from Day 1, regardless of what category people put our music in. People said, ‘No, this music is for me, and I need it,’ he said. “And then part 2, it’s for our label as a whole. Everybody had their hands on it — GAWVI, he produced on it as well. It feels like a collective win, a team win, not just a Lecrae win, so it’s a big deal,” he said. Asked how he responds to naysayers in the Church who still say that God is not in his music at all, Lecrae said, “You gotta test the tree by it’s fruit. I would say, powerful music is a forum if they’re not seeing or tasting the fruit of the tree. But there are far more testimonies of other people whose lives are being transformed by the power of God using words and music, and that’s what I try to listen to. You know, I wrote a book…they can read that if they need to answer any questions,” he said. 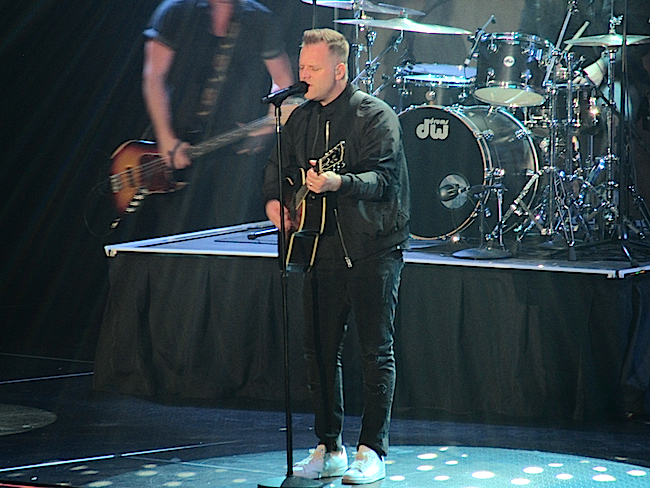 Multiple Dove Award winner and CCM favorite Matthew West closed out the uplifting celebration of unity and diversity with a power-packed performance of his hit song, “Mended”. Ultimately, everyone plays a role in respecting and supporting multiple genres of music performed by all ethnicities. From the fans who stream and buy music to the radio programmers who make the decision to play music that suits its audiences, to churches who narrowly focus on one category of music, to record labels who put their weight behind artists who impact the biggest buying market. 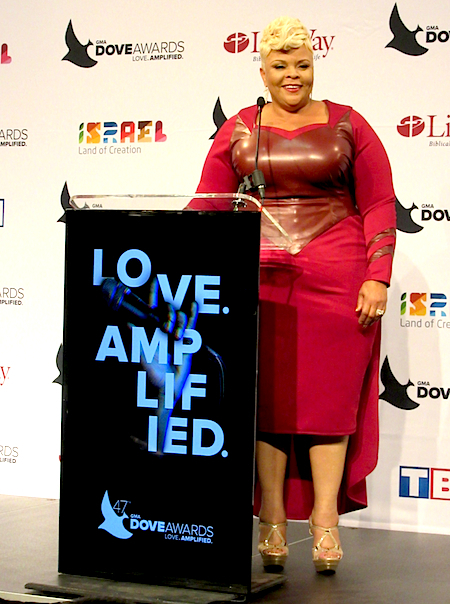 Many share the blame but the Dove Awards are reminding everyone that love needs to be amplified. We are stronger together. This entry was posted in Articles, Christian Contemporary, Cover Stories, Gospel and tagged 47th Annual GMA Dove Awards, diversity, Race by admin. Bookmark the permalink.